This is the second book in a Cranford-like series focusing on a small English village in the 1800s. Book 1, The Innkeeper of Ivy Hill, was previously reviewed here. THE PLOT: This volume focuses more on characters who were more secondary in the first book: Mercy, who lives with her aunt and runs a school; and Rachel, who came from a good family but lost everything. Rachel was being courted by Sir Timothy when her father’s downfall was revealed, and he backed away. Rachel has lost her home to her father’s heir, who wants to marry her. But Rachel would rather find some way to make it on her own (even if genteel ladies aren’t supposed to enter trade) and moves in with Mercy and her aunt. And just maybe, she’s still carrying the torch for Sir Timothy. Meanwhile, Mercy, the “homely spinster daughter” according to her parents, runs a school at Ivy Cottage even while longing for a child of her own. She may get her chance when a local man wishes her to adopt his secret granddaughter. But of course nothing is simple. Mercy’s parents want her to give up the girl and the rest of the school and marry a teacher. Is there any hope for a little unexpected romance for Mercy? 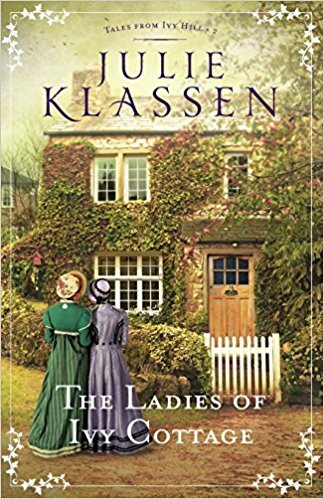 MY TWO CENTS: I really enjoy Julie Klassen’s books, and I’ve found that a series works even better for her. We do get to revisit the more prominent characters from Book 1, Jane and Thora, and I’m sure we’ll see them again with some resolutions in Book 3. We met Rachel and Mercy in Book 1, too, but we really get their major development here. As for our main characters, I really admire them both. Each has an easy way out that she refuses to take. Rachel struggles with accepting charity or an easy yet loveless marriage, and then chooses using the resources she has to start up a library. Despite being marginalized by her own mother, Mercy refuses to give up belief that she deserves happiness of her own choosing. However, neither of these plots seem anachronistic. The women aren’t rebels or early feminists; they’re just trying to do their best in the world of their time. BOTTOM LINE: I’m very much enjoying this series, and I think Julie Klassen has moved to an “auto-buy” status for me. TEACUP RATING: Five out of five teacups. ON SALE DATE: Available now in paperback, hardcover, and eformats. NEXT UP IN THE SERIES: The Bride of Ivy Green will be released in December 2018. Check out the author’s series page at talesfromivyhill.com.